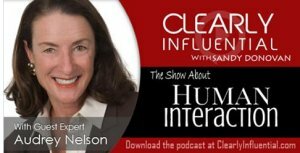 Audrey was interviewed by Clearly Influential with Sandy Donovan. This podcast is published on iTunes and Stitcher Radio. Audrey answered questions regarding influence, human behavior, communication and relationships as it relates to business. Click here for interview. Audrey was asked to address the recent sexual harassment incident by a South Korean National Assembly member by the only English radio talk show in Korea. She will draw on Code Switching tips to prevent sexual harassment in the workplace. (8/24/10) Tuesday August 24th 5 pm CST/8 am Seoul Korea – Host: HyoungJoo Choi – TBS eFM 101.3 Mhz – http://tbsefm.seoul.kr – http://twitter.com/thismorningefm – Click here for interview – Click here for story and pictures. Armin Brott, a nationally recognized parenting expert, is known worldwide as Mr. Dad. Guest for both segments: Audrey Nelson, coauthor or Code Switching. Topic: How to talk so men will listen.